Button Escape 20 - by Tototo Room came out a bit earlier than the last find-the-button game we featured in Weekday Escape (but you probably guessed that already, given the subtle signs, like the number "20" and such, we escapers being a brilliant crowd and all). 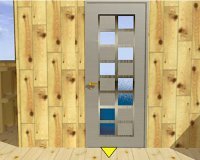 Like before, all the gameplay centers around uncovering and clicking on 11 buttons to open the door. You'll see them under things and on things and, happily enough, secreted away behind locked cupboards giving ample opportunity for all that good decoding we love to do. The puzzles here are twisty enough to involve lateral thinking without holding you up. Yes, it's as much fun as Button Escape 22. We're sorry we took so long to come around to Tototo Room but just think of it like we've DVR'd them, now taking our time playing through. Escape from the House with a View of the Sea - from Neat Escape indeed has a pretty keen seaside vista to behold, but the inside of this shack seriously needs a visit from the designing divas. In realtor speak, this place would be called "quaint" and "full of character", read: a tad bit pixel-hunty and a couple less-than-intuitive tasks (a strange device, a hydroactive sheet, and so on). Yet it's remarkably able to deliver a satisfying escape-the-room quickie, engaging the brain long enough to give substance and polished enough for visual appeal—sized right to transition from buttons to diamonds. Escape from the Room of the Diamond Apparatus - Yomino Kagura's formula is readily identified the moment you enter, with a smattering of standard puzzle techniques, as straight-forward as doing simple addition, and still it manages to make the puzzle-solving aspect as gratifying as ever. There's a changing cursor and no fussy pixels, although a needed item hidden in plain sight might still be overlooked. Though Escape from the Room of the Diamond Apparatus doesn't have the complexity the title tends to promise, there is a quiet enjoyment in well-implemented puzzles that flow smoothly from one task to the next. Weekday Escape N°35 Walkthrough now available! Click the toothy monster's eye. Open the toothy monster's mouth. Move the toothy monster's foot. Lift the gray rock on the shelf. Click the rolled-up red carpet under the table, then click the end that opens. Zoom in on the paintbox on the floor. Lift the life vest (well, what else could it be?) on the small white table, then lift the table. Click the rolled-up banner on the wall to the right of the door. Note the "RYGB" on the banner. Click the red door and enter the code. 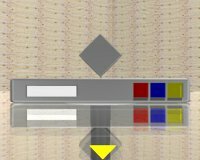 Colorblind: 6 clicks, 3 clicks, 1 click, 2 clicks. Note the symbols behind the red door. Click the eyes of the "scream" statue and notice what symbols they make. Click the eyes & mouth according to the code. Notice the number: is it backwards or upside-down? Click and hold the nose of the statue and notice what happens to the code. Put the numbers into the blue door. Get the key. Use the key on the "Museum" sign. Note the writing on the back of the museum sign. Combine with the front of the sign to get a four-digit number. If MU = 69, then what does UM equal? Use the number on the red box on the shelf. Wait for the figure to wake up and move. Exiting: don't forget to hit the "OPEN" button above the door. The bottom of the wardrobe is locked. The TV probably needs a remote. It's a wobbly picture with a quarter-note on it. The couch has a big red circle with the number 130 in it. On the coffee table is the usual checkerboard box with slots for three shapes. You can go ahead and put your circle there, if you want. Use the code from the top of the wardrobe to open the box on the round table. Use the key to open the bottom of the wardrobe. Note the big blue circle with 53 in it. There's also a box with a blue square on it. Use the two circular numbers you've found to open the box in the top of the wardrobe. Look at the square you just found. Flip it around and note the writing. 9IL? That doesn't look too useful, but what if it's not the right way up? Turn it upside-down (in your head) to get 716. Use the code to open the box in the bottom of the wardrobe. Get the remote. Use the remote to turn on the TV: it's a quarter-note, that looks familiar. Observe the numbers in the corners. Click the corners of the wobbly picture according to those numbers. Put your three shapes into the checkerboard box on the coffee table. Get the key and use it on the door. It may be helpful to note that all of the Japanese phrases are followed by English translations, including "About Item" descriptions, in case you aren't sure what something is. Find the Left-Right Code on the Door. Use the grey panes for your clue. Find the ICE in the freezer. Press the power button on the ice machine that you just plugged in. Use the ICE on the machine. Take the shaved ice and wait for it to melt. Look it again and it should be a bowl of water. Combine the water and the paper to get the code for the Green Numbers box. I know it's too soon, but this red key is actually the exit key. More time to enjoy the view, I guess. Responsibilities Schmesponsibilities, I like taking a little time for some escape gaming. Finished Escape from the Diamond Room pretty quickly and on to the next one. A nice little break from the day indeed. Well, they all managed to be quite easy. Be prepared for some pixel hunting. the "1350" being projected by the head on the right. I can't make that number work on either of the two doors I haven't opened yet. holding down the statue's nose. Yeah, I had the same problem. Seems to be a problem with many games. It makes you think you've done everything possible in that area until you get mad and click there some more and accidentally get the right spot. Other than that, I don't feel like I was hunting pixels on the sea view game. The sea game is easy enough to not have to be prepared for what kind of sheet you may encounter before you go into it. When I had those two items that's the first thing I tried. There's an evil video ad on that sea game that has audio and starts playing a few seconds after you've made the game all big and centered and then you have to look around for what's making the noise. It might not always be there but the five times I've tried going to that page it's been the same annoyingness. Also, in order to get the "click here to go to the top of the page" widget to get off of my nice and big zoomed in game I have to turn off styles in my browser. It's an anti bigness bug! but nothing else gave me any problems. then have to click again on something in a different spot. That took a little bit of remembering other games and how they did that same thing. Room's Room this time was SUPER easy. The keys all look the same, but that wasn't really an issue this time. I feel like an idiot. I finished the first two easy enough, but on the diamond room, I can't figure out what to do with the tv or note picture. Pick up everything you can and examine items in your inventory until you find the numbers you need to add. The order for the three button box is in a cupboard. There's a red circle you need to pick up somewhere, too. Look closely at it. doesn't have anything on it. Check the couch instead. Did pretty good on button escape until I got stuck. Had to look at walkthrough. clicking on the nose of the statue to reverse the code, doh! I now realize that the "cabinet" I found the "brick" in was actually a block of ice in a refrigerator and the "powder" was shaved ice and it melted not "disappeared" and the dish was actually now a dish of water that I had to put on the paper. Good grief. Enjoyed the Triangle Room the most of all of these. I spent ages clicking everywhere. Two things really frustrated me. First, the stove was illogical. I kept trying to find a spot in the sun to melt the ice, and actually clicked the stove by accident after several minutes of aimless clicking. I didn't think the stove was functional because of the lockbox sitting on top. The sink wasn't working, but the stove was??? Who operates a stove when some huge thing is in the middle of it? Secondly, the pixel hunting drove me mad. I literally spent 5 minutes just trying to click the picture to move both directions, and it would only move to the left. I then clicked every spot on every board behind it and found nothing. I came back later to try again, same results. Imagine my chagrin when I checked the picture for the 4th time and clicked it to the right by accident as I was trying to back out of the scene, revealing the paper behind it. I was out in 90 seconds. A game meant to be solved in 5 minutes but that takes me 30 minutes instead because of something so simple as that is a disappointing let-down to say the least. But I enjoyed the other two games a lot. Too bad walkthroughs were already posted for those, and the only one left was the one I hadn't enjoyed. Haha. Well, better luck next time. what exactly was that creepy little guy sleeping in the red box? oven on sea escape. it says i'm to put the shaved ice on the oven to melt it but no matter where I click nothing works. ...It just melts over time. It should melt within a couple minutes. It did for me at least. Try highlighting it? Oh no. I just came back to check on this to see if walkthroughs had been posted yet. Glad to see my contribution was honored by being put at the top of the page. :) But unfortunately :( I didn't replay the game before posting the walkthrough, and I noticed two errors. :( Do I need to repost the whole walkthrough (not a big deal, just a matter of copying and pasting) or is it better to just amend it with a separate comment? Just let me know what needs changing and I'll edit it. Thanks! 1. The line for finding the paper should read "Click the right side to move the picture right"
2. In the description for how to melt the ice, I stated that it needs to be put on the stove. But that didn't work the second time I played it. I'm not really sure what the trick is. I would change the walkthrough to say "The ice needs time to melt. Click around the scene for a minute until the cone of ice in your inventory disappears and water appears in the container instead of ice." The reason she's sad is because there's only a tiny amount of space behind that door. She's lived there for a long time, so long she lost hope of ever seen the sun again. And, she's got a button pressed in his back. That's it! She's sad because she's been uncomfortable for a long time, and just wishes somebody would press the button that's been jammed against her in the little box. She's like an uncooked gingerbread princess lying on a button-shaped pea.